Can you think of a business – large or small – that doesn’t have a Facebook page? Since most businesses have a Facebook page, you need to always be looking for ways to stand out and make yours count. Give your Facebook Business Page a Boost – Assign it a “Template”. Services: This template is designed to help people find your services and get in touch. The “Call Now” button encourages people to take action. Business: This is great for B2B Facebook pages. It helps you manage ways to post jobs and special offers. Venues: Use the Venue template for Facebook business pages that host gatherings and events. It can highlight useful information like your venue’s hours, location, and upcoming events. A “Learn More” button encourages users to find out more about what is going on. Nonprofit: This template highlights your cause and encourages people to fundraise and donate to your nonprofit. Restaurants & Cafes: Use this template to highlight information about your menu, hours, location, and photos. Shopping: This template is designed to showcase products and make it easy for people to shop online. Politicians: This template helps politicians reach their supporters and communicate their message. 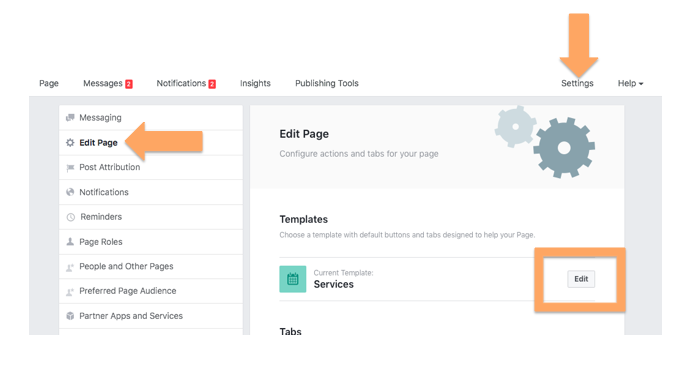 To choose the template that is right for you, go to ‘Settings’ > ‘Edit Page’ and ‘Templates’ will show up. Click ‘Edit’ to see the 7 options. Select your template from the list. *We selected the ‘Services’ template for our WMT Facebook page! 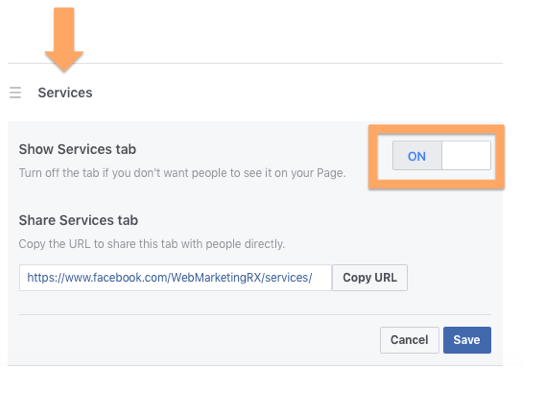 Once you have selected your template, you can further customize your page by turning ‘On’ or ‘Off’ the Tabs that you want to appear on your Facebook business page. Pay attention because everything listed is what is appearing on your Facebook page! Chances are you do not need all those tabs. If there is a tab that does not pertain to your business and you wish to turn ‘Off’, click on the ‘Settings’ button next to it. When you turn it ‘Off’, it will no longer be displayed on your Facebook page. One last thing! If you selected a ‘Services’ template, don’t forget to add your phone number to the ‘Call Now’ button that is located below your cover photo on the right side. Click on it to add your contact phone number. After that is done, you can hover over the button will bring up other editing options. You’re almost done! 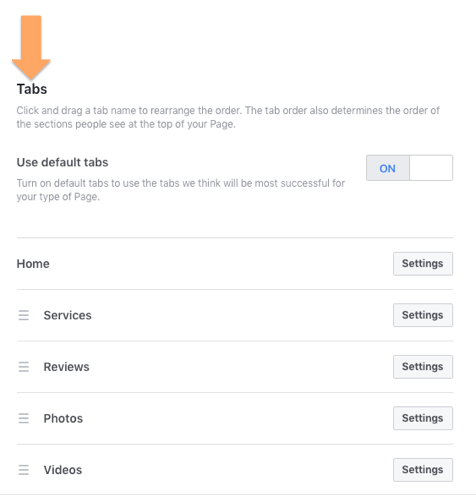 Once your tabs are chosen and your phone number is set up, go back to your Facebook business page and review the changes. Click on the tabs, make sure everything is linking properly, and all information is appearing in the order that you wish to see it. It looks like template options for Facebook business pages was rolled out in the beginning of this year. In my investigation, many businesses have not yet taken advantage of them! 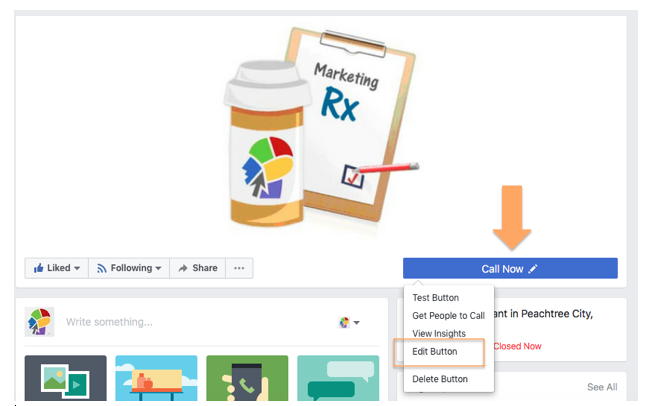 If you haven’t, I highly recommend that you jump in there now and make these simple changes to give your Facebook business page a boost.